If you enjoy diamonds, this could be a good time for a extra special treat, as many retailers have discounted prices about 15% in the past 12 months. But that requires a deep dip into your cookie jar. Diamond sales are suffering for a reason; this is not the time when most of us decide to break the bank for a new bauble. - a piece that you inherited, but was never "you"
- jewelry from an ex; let's get the karma off that thang! You might have small diamonds lounging inconspicuously on the shoulders of a ring, or set in a bracelet or pin that's dated. Resetting them in a new piece releases their potential. Don't ignore small stones, offer them a new home. 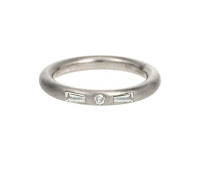 This Pat Flynn Diamond Stripe Ring shows how a single row of small (10-point) diamonds has presence. (All photos provided to give you ideas, but of course you could fall in love with a finished piece; they are offered online at Twist). Not enough diamonds to make the circle? Buy the rest; the cost is a few hundred dollars or less apiece. The daring of iron (the black exterior), diamonds set in platinum, and the 18k gold interior, now that's design. Project #1 : Pull the old stuff apart and use the bits in a fresh design . Here's what you might do with a boring engagement ring: first, make a 3mm band. Example: Use two trapezoid baguettes (an elegant cut often found on the shoulder of a '30s to '50s ring), teamed with a small diamond, salvaged or new. 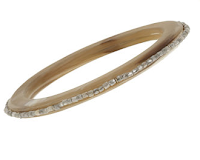 Example, shown: Cathy Waterman's Platinum Tube Band, lovely on its own, or as a stack ring. 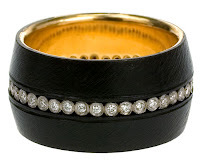 This band is deliberately discreet; it reminds me of one Audrey Hepburn wore. If you have older-cut diamonds (ca.1950 or earlier), choose a classic but not ho-hum design; otherwise they look out of their time, like an obviously lifted face. Want more flash, you little minx? Here's a hand-grabber that uses pointers to thrilling effect, a nearly 5ct. 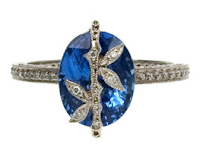 sapphire beneath a vine overlay of tiny diamonds, on a band of pavé. 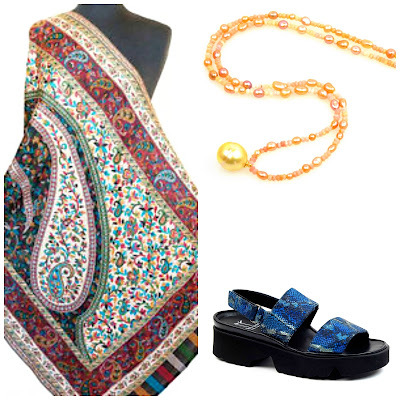 This Cathy Waterman design is shown to give you an idea. You need expert execution and a generous centre stone, which need not be precious. Even resin would suit this overlay technique. So what to do with the centre stone? Girlfriend, I'm getting to it, that's project #2. If the diamond is under a carat, it can shine in more modern designs. I've deliberately chosen pieces other than rings; here are three necklace options. The bezel-set solitaire necklace is a major doze. If you have one, let's add it to the rehab stash too. 2. 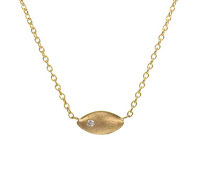 If you have more small diamonds to work with, consider a design similar to the Andrea Fohrman Sophia pendant. 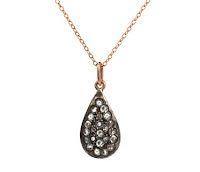 The smaller diamond you received long ago would sit up and say hey set in 14k pink gold and oxidized gold. Forhman's uses small stones but you could add a larger one or use mixed sizes. 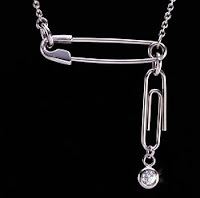 Notice how the materials lift the diamonds; the quality of the chain is essential. 3. My favourite way to use a single diamond is in a clasp or focal element in a string of beads, for example, pearls, coral, malachite or lapis; the beads need not be costly. 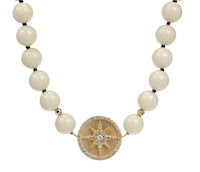 Shown: a white coral necklace by Mizuki, below, with a 1/2" diameter starburst coin charm set with that diamond. Take a risk, do something so relaxed that people wonder, "is that a....diamond?" Example: An eccentric take (and the only piece not from Twist), Vivienne Westwood's diamond safety pin and paper clip necklace. A friend had a similar design made with the half-carat oval diamond from her ca. 1970 engagement ring and never removes it. On hers, the "paper clip' detaches, and she can add other charms. Remember to recyle your gold or platinum, or ask your designer if she has scrap. A number of jewelers participate in Earthwork's "No Dirty Gold" project. A charm for a friend commemorating the birth of a child? 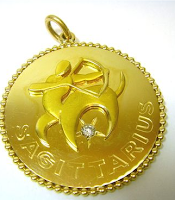 A diamond twinkling in the clasp of a small gold box for your mother? A jewel-set letter opener for a beloved mentor? A teeny diamond on your dog's collar? I thought of this when I saw this sign in the doggie grooming boutique in my neighbourhood: "You cut off my nuts, the least you could do is buy me something nice." A fun post with lots of great ideas - thanks! How timely is this? I've recently talked to a jewelry designer who's going to help me rework my engagement ring to better showcase the old mine-cut stones. I had a "matching" band with stones as well, which was lost last year when I was having surgery, so what remains looks a bit lonely. My husband's family was very fond of reworking jewelry periodically to accommodate new stones or just freshen pieces. I just love that paperclip necklace! So irreverent! the re-furbishing ideas are all great, of course, but I'm chuckling at the dog's complaint -- reminds me of a cartoon I saw once of a Dog approaching St. Peter and the Pearl Gates, asking "Now can I have my testicles back?" Pseu: May I suggest you borrow or buy some vintage jewelry books (Cartier, Tiffany) to research designs you like? 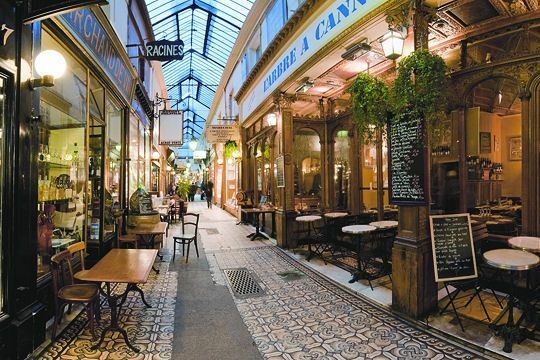 And in Paris, there are some wonderful vintage jewelry stores- Dary's is one large one- to check. Design for a vintage stone takes a very respectful jeweler with knowledge of techniques used in that era but not so much these days- millegraining, engraving, openwork. For example, see http://www.faycullen.com/antique_ring_settings/500/eac0060md.html, which is vintage yet quite simple. Great ideas Duchesse! No need to store jewels you don´t want to wear, when you can create something as beautiful as you have shown us. If I had any left, I just might place them on the collars of my dogs ;) ! Lots of ideas in this post, and I too love that paperclip necklace. It reminds me that there are things I need to get reworked. Certainly got me thinking. I absolutely have diamonds hanging around, and, come to think of it, they are pendant solitaires and other necklaces which I don't wear precisely because they are so unremarkable. One smallish diamond, not so useful. Three smallish diamonds, hmmmm. LPC: You can do so much, please return and tell us what you decide! I love this! So you have any advice on how to find someone who can turn our vision into reality? I have absolutely no idea where to start. Anonymous: A post specially for you will appear on Tuesday, August 18- thanks for asking! Oh yes! The plan is for the jeweler to take the seven small diamonds from my husband's old wedding ring (to his ex, whom he left way before I ever met him so no, I did not break up a marriage) and make dangly earrings, one with four diamonds in a row and the other with three. Yes, they will be different lengths. class-factotum: Wish I could see these, they sound intriguing! 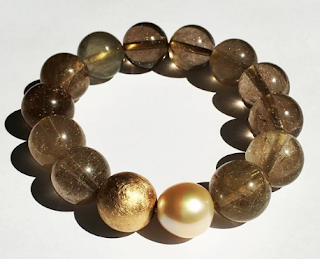 When repurposing the stones from a piece which could carry some emotional history, I recommend making an entirely different type of jewelry, as you have.